International Dark Sky Week is bookended this year by two mass public events: the National March for Science, April 22 and the Peoples Climate Movement march, April 29. The March for Science has its focus on the funding and accessibility of science, while the People’s Climate Movement is focused on calling attention to the need for bold and urgent action of the global climate crisis. Light pollution is a threat to astronomical research, personal safety, and the health of both humans and wildlife. Light pollution is also a major contributor to climate disruption. About 15 million tons of CO2 are emitted each year, mostly to illuminate streets and parking lots. Up to 50 percent of that light is wasted. Too much light, unshielded light, and improperly aimed lighting costs the US $3.3 billion per year in wasted energy. 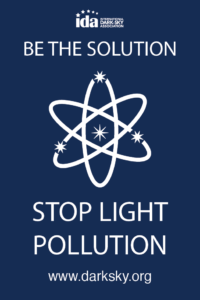 The March for Science and Peoples Climate Movement events are each significant opportunities for you to spread the word about light pollution. And you don’t have to do it alone! 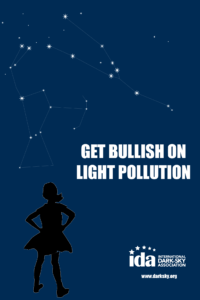 IDA has made the following light pollution awareness posters available for you to download and print. The posters below are large format and can be printed in poster size at a commercial printer, or printed onto standard size paper on a home printer. Please share this free resource. Thank you for all you do to help spread the word about light pollution! 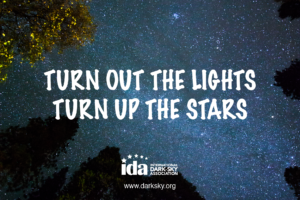 If you find these posters valuable and want to help IDA continue its work of fighting against light pollution, please consider making a $25 donation today.